This is an elegant sword. Perfectly healthy and robust. A true Katana, in excellent Jo-polish. Yasutsugu is listed as an 800 Mon Yen smith which is Jo-Jo Saku level of Dr Tokuno. Founder of the Echizen Yasutsugu line. Shimosaka Shirouemon or Ichiuemon. 3rd brother of the First Generation Yasutsugu. 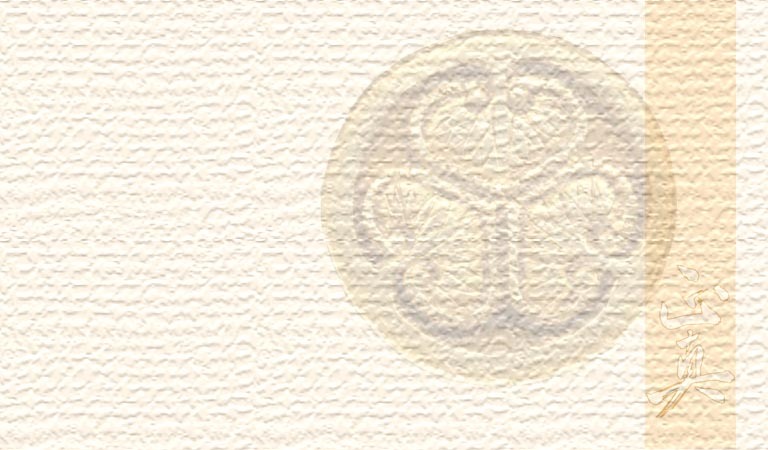 At the death of the second generation Yasutsugu, he received, at the Echizen Mansion, the appointment of inheritance of Yasutsugu and became Echizen Yasutsugu, then to be called the 3rd Yasutsugu, following the second generation. Yasutsugu 3rd Generation is the founder of the Echizen Yasutsugu Family. The son of the Second Yasutsugu received the 3rd Musashi Yasutsugu and continued the Edo branch. This is how the two branches came in to being. His work-period spans Kanbun 1661 to Enpo 1679. He died on the first day of the year Shogatsu, Tenwa 1681. Many of his swords are in the style of the first Yasutsugu and the second Yasutsugu. The 4th Generation Echizen Yasutsugu, Yoshirokichinosuke, worked in the Genroku 1688. The 5th Generation, Takeuemon Kyoho 1716, 6th Generation, Takeuemon, Horeki 1751, 7th Generation, Shirouemon, Kansei 1789, 8th Generation, Ichizaemon, Bunka 1804, 9th Generation, Ichinojo, Bunkyu1861. The Yasu in their name was given by Iyeyasu Tokugawa from his own name. This is the famous line that were the personal swordsmiths to the Tokugawa Shoguns and the elite families of Japan. 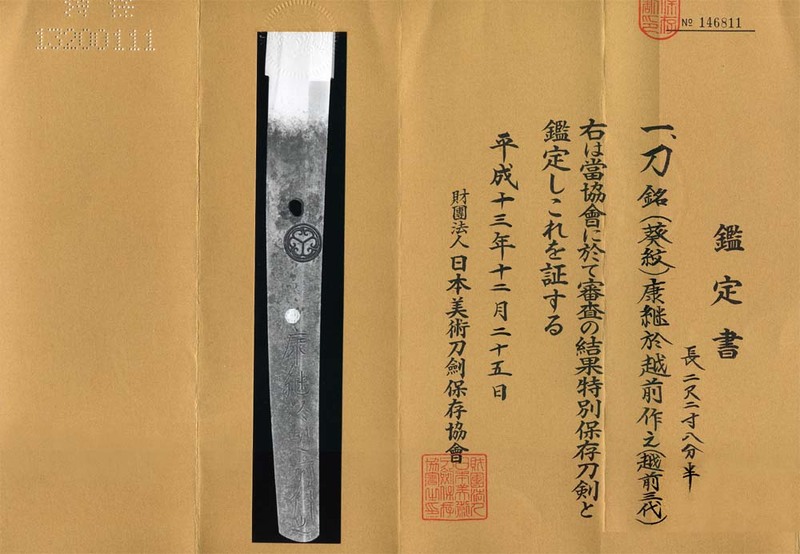 The work in this sword is highly excelled and it's quality has reached the very zenith of Edo period Japan. The Sugata is perfection. 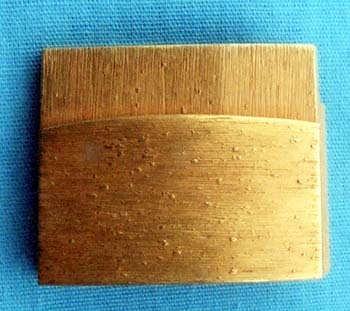 The Ji-tetsu is a well-knit Mokume Hada. Masa in the Shinogi-Ji. 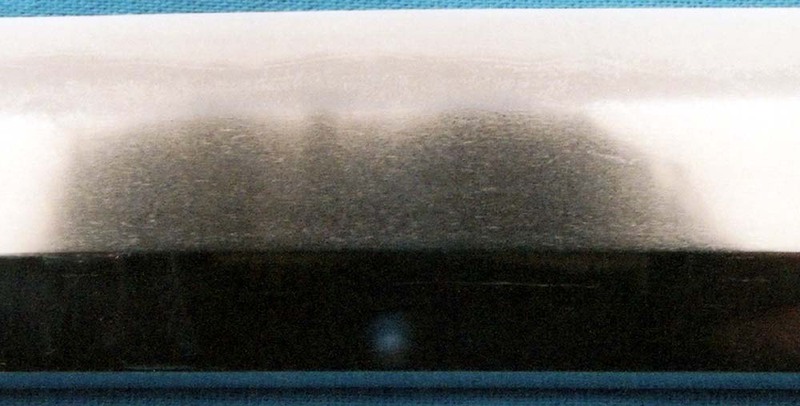 Hamon is a Chu-width Midare Ba of an undulating Ko-Notare line, very evenly set. Kinsuji and Sunagashi appears through a Habuchi of swept Hotsure; where Nie and Ji-nie Jiba create Niju lines running in the Ji. This is the sweeping Soshu style for which Yasutsugu is famous. Round Sagari Maru Boshi of Ko-nie Hakikake. Nakago is Ubu, with Machi-Okuri. There are two Mekugi-ana, one filled. 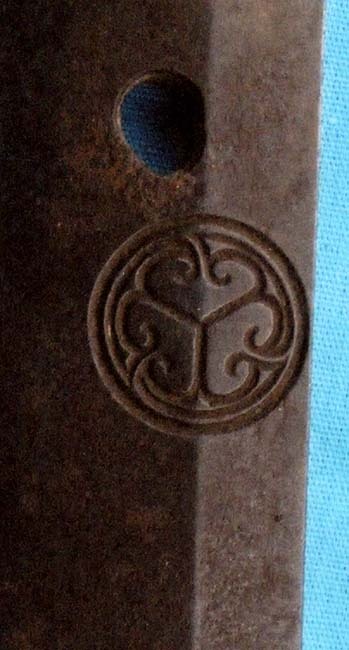 The "Kore" is stylistically formed at the Jiri to appear both as a Lotus and as a Vajra sword-handle. In Shira-saya with Tanobei Saya-gaki, Jo-polish and gold covered double Habaki. NBTHK Tokubetsu Hozon certification.